Alabama native Emmylou Harris spent time in North Carolina in the mid 1960s when she was attending the University of North Carolina at Greensboro on a drama scholarship. 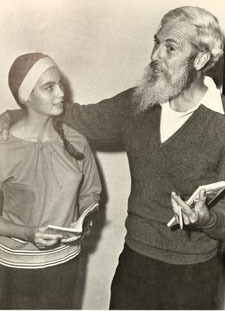 This photo, from the 1966 edition of Pine Needles, the UNC-Greensboro student yearbook, shows Harris with faculty member Arthur Dixon during rehearsals for The Tempest. Harris played the role of Miranda, daughter of the book-loving magician Prospero. It was apparently (according to her Wikipedia entry) at UNC-Greensboro that Harris began to pursue music seriously, eventually leaving school to try her luck in New York. 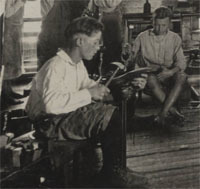 Eighty-eight volumes of The Quaker, the student yearbook of Guilford College, are now available online at DigitalNC.org. The yearbooks, part of the Friends Historical Collection at Guilford, range in date from 1911 to 2005. I’ve just been looking through some of the early Chowan College (now Chowan University) yearbooks that are now available online. One thing stood out to me: the clubs. They had the standard clubs that you usually see on college campuses, like a glee club and an art club, but in the early days at Chowan, there were a whole lot more, like the Air Castle Builders Club, the Taffy Club, and the Canoodlers Club. The names changed every year, and all had comical pages in the school yearbook. 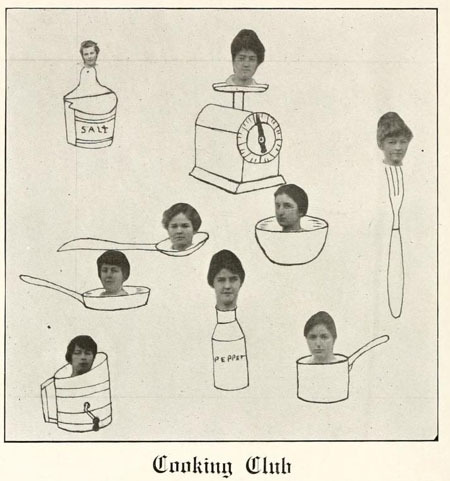 Here are a few of my favorites: the Societa Italiana (1914), the Toasters’ Club (1916) and the Cooking Club (1917). 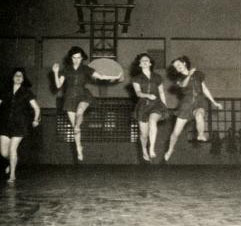 Most of the yearbooks in the North Carolina College and University Yearbooks collection have sections for senior (or other) class superlatives. These are the folks voted to categories like “Hardest Worker” or “Most Likely to Succeed.” These are for the most part positive distinctions, with the exception of the 1920 Yackety Yack from the University of North Carolina (now the University of North Carolina at Chapel Hill), which included awards for “Ugliest” (Otto Bryant) and “Laziest” (Luke Umstead). 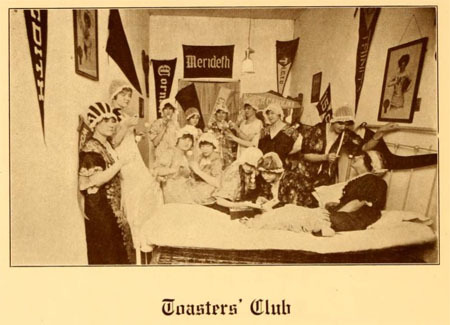 Unfortunately for Bryant and Umstead, the class of 1920 looks to have been pretty prescient in some of its selections. The pick for “Best Business Man” was Ben Cone, who would become an executive at the Cone Mills Corporation and serve a term as mayor of Greensboro, while the pick for “Best Writer” was Thomas Wolfe, who would go on to write Look Homeward, Angel and You Can’t Go Home Again. The Images of North Carolina collection features many fascinating images from the Sallie Mae Ligon Museum & Archives & Masonic Home for Children at Oxford. 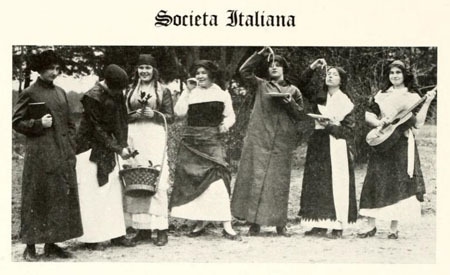 One of my favorites is a 1922 album containing a series of photos taken around the campus. The orphanage in the 1920s looked like a pretty self-sufficient place, with its own bake shop, livestock, printing press, and shoe shop. 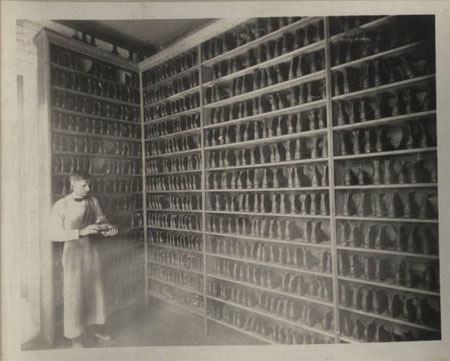 The photos here show one of the boys at work on a pair of brogans and, below, the impressive results of their labor. Seventy-four volumes of the Pine Burr, the yearbook of Campbell University in Buies Creek, N.C. are now available online through DigitalNC.org. The volumes available run from 1912, when the school was known as Buie’s Creek Academy, through 2009. Some of the most impressive — and certainly the largest — items shown on DigitalNC are a group of antique quilts from the Orange County Historical Museum in Hillsborough. 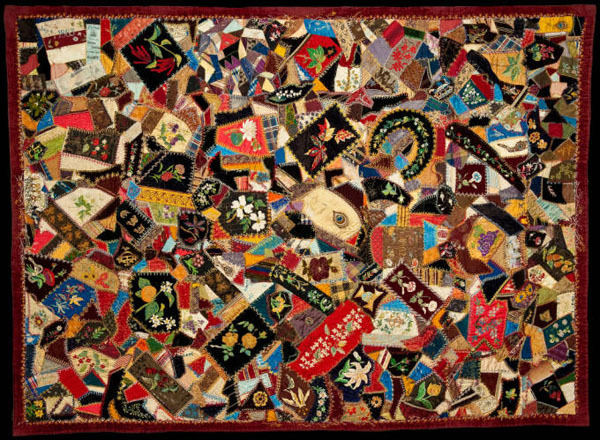 These four quilts include an 1883 crazy quilt (shown here), another crazy quilt and a log cabin quilt from around 1900, and a World War II quilt honoring men from this area who served in World War II. 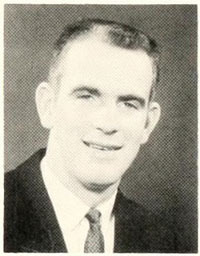 This photo, from the 1959 Pine Burr, shows Gaylord Perry, one of North Carolina’s greatest baseball players, and a member of the Campbell College (now Campbell University) class of 1960. The Hall of Famer, a native of Williamston, N.C., is probably baseball’s best-known spitballer (his 1974 autobiography is called Me and the Spitter: An Autobiographical Confession). I wondered whether it was the folks at Campbell who taught him the illegal pitch, but according to Perry, he didn’t learn how to throw a spitball until 1964.